When I started out making food from scratch and not knowing what real chefs use in their kitchens, I had to make use of what I had. I had sets like these and they were old, but still brand new, as I never really used them nor did I know how to use them. Yes, call me dumb dumb, but honestly, I believe there are a few people out there who must be thinking the same as I did back then. 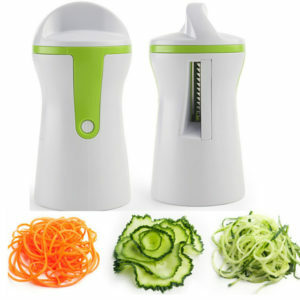 I have learned that the most necessary kitchen appliances, appliances I now use every day, don’t have to cost a fortune. 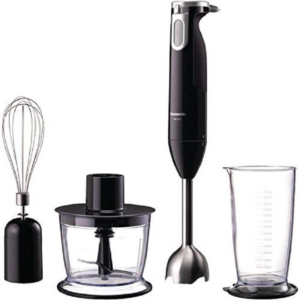 With these simple appliances you will be able to do almost anything. You don’t need the most expensive ones out there and luckily there is a variety of brands available for every budget. 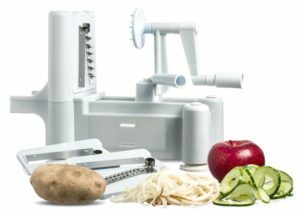 I am by no means suggesting that you spend your money on any of these, but I do believe that these appliances may be beneficial for those of you who are determined to make a difference in their eating habits and want to start making meals from scratch. It will make life in the kitchen so much easier. I have included images for those of you who aren’t familiar with these appliances. This is also great for making your own flour, such as oats flour, or even nut butters, such as macadamia or cashew. I would not recommend making Almond butter with a little blender such as this because it is heavy on the little engine and blade. Smoothies, Sauces and Soups (I use mine to blend sauces and soup while it’s still hot). 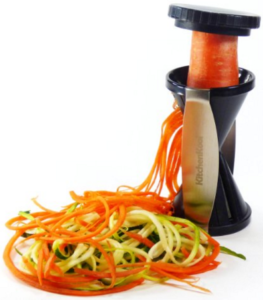 For measuring and to make life easier when making a single serving smoothie or sauce. The following items also come in handy. 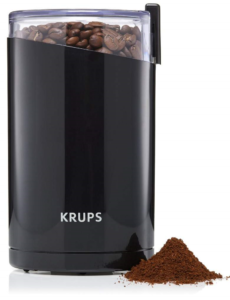 I for one don’t drink coffee and maybe used mine to grind coffee beans, like, five times, but oh boy do I enjoy this little helper. They are really inexpensive and takes almost no space in your kitchen and the best part is most of you probably already have one of these. If not, tell your family or friends the next time they ask for suggestions on birthday or Christmas presents. I love to use my little coffee grinder to make Flaxseed, Chia Seeds and Xylitol powder, as well as Oats flour. I find the coffee grinder to give better results than the blender when making flour. I do not recommend using this to make nut flours (such as almond flour), as something hard can get stuck between the blades. The blades are, however, very effective, but you should test them first to see what they can handle. 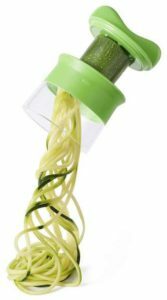 If you are obsessed with your veggies and love pasta, then get creative and make your own veggie pasta. They make mealtime, especially with kids, so much fun. They come in all shapes, sizes and again a couple of brands to fit your budget.